It's June Blog Hop time! This month I chose to write about resources I'd wish I knew about back when I started poling. I started pole dancing in 2008- back then there weren't many resources outside of YouTube videos. Not long into my pole journey, I stumbled upon a website dedicated to my new love of pole, www.StudioVeena.com. The website had just launched a few months prior to my discovering it. Studio Veena became my main source of information and where I would grow into my dancing. There was very little resources available to me in regards to local studios. One thing I'd wish I'd done more of in those earlier days was take advantage of traveling opportunities and explore pole studios. It wasn't until several years after I started pole dancing that I begun to take classes at any studio that would be within proximity of any number of my various travel destinations. I think my mindset in the earlier days was focused on the level I'd convinced myself I was at in my progress. Thinking I was too advanced for beginner level classes also hindered my progression. As I know now, you are never too advanced or above taking a beginner level class. Every class opportunity serves as a learning experience and it's important to embrace every opportunity as it is presented. I also would have loved to have started working on flexibility five years ago. Flexibility training is something I'd wish I knew about when I started poling. Flexibility progression is not an overnight or even something easily accomplished in one to two weeks. I've learned flexibility is an ongoing process that takes many years and lots of patience. That about sums up three of the most important types of resources I would recommend to someone just beginning their pole journey. Along the way, I have learned the great thing about pole is it is very forgiving in that it's never too late to make use of what you learn today. *Blog Hop is a monthly blog topic involving pole dancing blog contributors from around the world. Each month we write our perspective about a given topic pertaining to the pole dancing community. 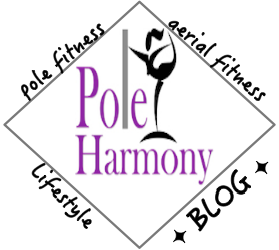 To read fellow pole dancing blogger's June Blog Hop entries, click here. I love flexibility training too--although it definitely took a long time to stop looking at flexy as something I should have had yesterday! IT'S OFFICIAL! I'm a studio owner.